With three jazz bands and a vocal jazz ensemble, there are plenty of opportunities to be involved in the jazz program. 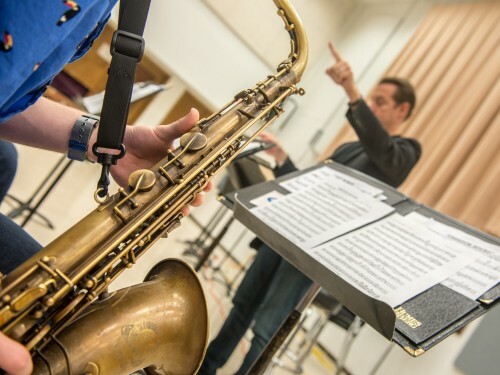 Concordia jazz bands often feature world-renowned guest artists such as Phil Woods, Dave Weckle, and Peter Erskin. Great local jazz artists also frequently make appearances. In addition to five major concerts a year, Jazz Ensemble I performs on Concordia’s annual Day of Percussion with some of the country’s most sought-after players. While most of the concerts happen on campus, the final concert is at a downtown Fargo jazz club. Jazz Ensemble I is conducted by Russell Peterson. With four major concerts a year, Jazz Ensemble II also regularly performs at regional conventions and educational events at local schools. Jazz Ensemble II is conducted by Dr. Peter Knudsvig. This jazz ensemble is the newest and was formed out of an increased student demand for jazz opportunities. Jazz Ensemble III is led by guitar instructor, Eric Martins. They meet Monday evenings at 8:00pm. 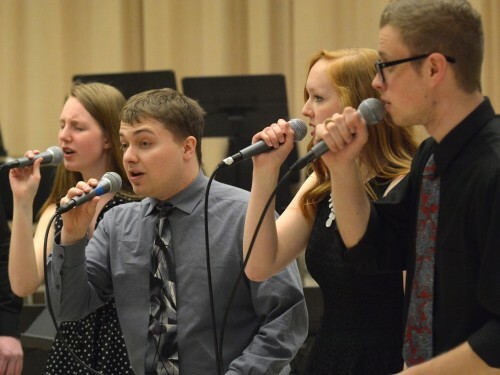 Concordia’s Vocal Jazz Ensembles provide a multitude of opportunities for students interested in the world of jazz – from singing in the ensembles or playing in the rhythm section to working as a sound technician. Their repertoire includes music of the The Real Group, Swingle Singers, New York Voices, Glad, and Concordia-alum Phil Mattson. Auditions are held in the fall and the ensembles perform two home concerts a year, along with various run-out concerts each semester. Jazz Day at Concordia features Jazz I & II, renowned guest clinicians, and high school jazz bands from across the region. The Concordia Vocal Jazz Festival is one of the region's premiere festivals of its kind.